Ben Runkel sent in this one. "This is a picture of me (Ben, left) and my friend Justin (right). I play snare with the Blue Stars and Justin plays trumpet with the Cavaliers. This summer was our first year of marching corps and this was our first show together. I finished my performance and was drumming after the show when I saw him walk by on his way back to the buses and we took a quick picture. We both went to Naperville Central H.S. in Illinois, where we marched in the band together for four years, played in the same jazz groups, concert groups, and ended up both winning parts of the Mr. NCHS competition. We both went on to major in music at different universities and march at different corps, so it was great to see each other on tour." Thanks Ben! 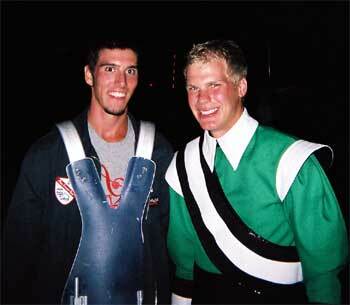 E-mail your best shots from the summer to dave@dci.org along with where and when the photo was taken. Send some biographical information about yourself as well. We'll give you full credit. Also, let us know if you want your e-mail address included.